TORRANCE, Calif. – April 13, 2016 – TRENDnet® (www.TRENDnet.com), a global leader in reliable SMB and consumer networking solutions, announced the relaunch of its TRENDnet IPView mobile app which allows remote access to your IP cameras and NVRs. TRENDnet IPView is designed to bring live video from your TRENDnet IP cameras and NVRs to your AndroidT or Apple® mobile device. The new version features an improved interface to help manage cameras more easily. The latest update also includes minor stability and performance patches. TRENDnet IPView is available for free on the Google PlayT and on the App store; the in-app upgrade is available for USD $3.99. 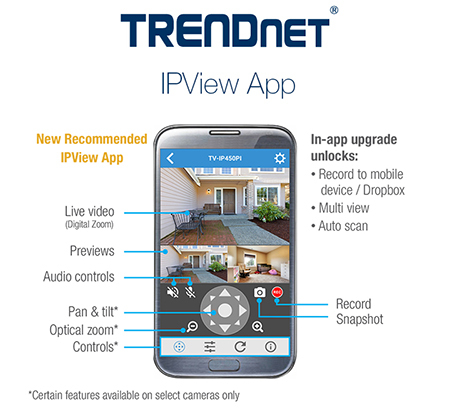 The majority of TRENDnet’s latest home and business IP cameras and NVRs will be supported on the TRENDnet IPView app.